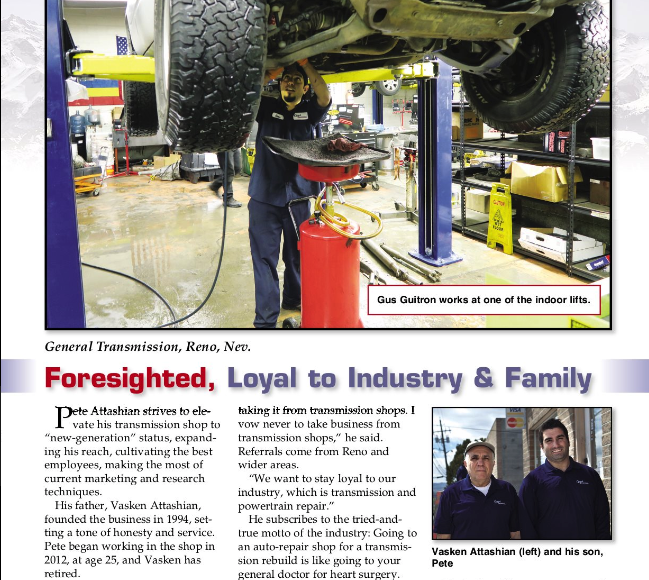 Pete Attashian strives to elevate his transmission shop to “new-generation” status, expanding his reach, cultivating the best employees, making the most of current marketing and research techniques. His father, Vasken Attashian, founded the business in 1994, setting a tone of honesty and service. Pete began working in the shop in 2012, at age 25, and Vasken has retired. One more way to grow the business involves not competing with other transmission shops. “Another goal is to get as much business as I can from auto dealers and auto repair shops instead of taking it from transmission shops I vow never to take business from transmission shops,” he said. Referrals come from Reno and wider areas. Read more of the three-page feature online.